One of the things I love most about volunteering with TEDxRVA’s Community Team is the variety of topics we explore, how much I personally learn through the process of planning the events (like how to spell “entrepreneurship”), and the connections I’m able to make with other people who care deeply about what’s going on in RVA. This month’s Salon event did not disappoint. We had great food from Max’s Positive Vibe Café (stuffed baby portabellos, watermelon and feta skewers, and seven-layer dip cups, oh my!) and got to preview the brand-spanking new Six Points Innovation Center (they have their official grand opening on June 6th). Capital One brought their mobile ATM and goodie-bags with some swag, including a phone-powered mini-fan that quickly became my precious. 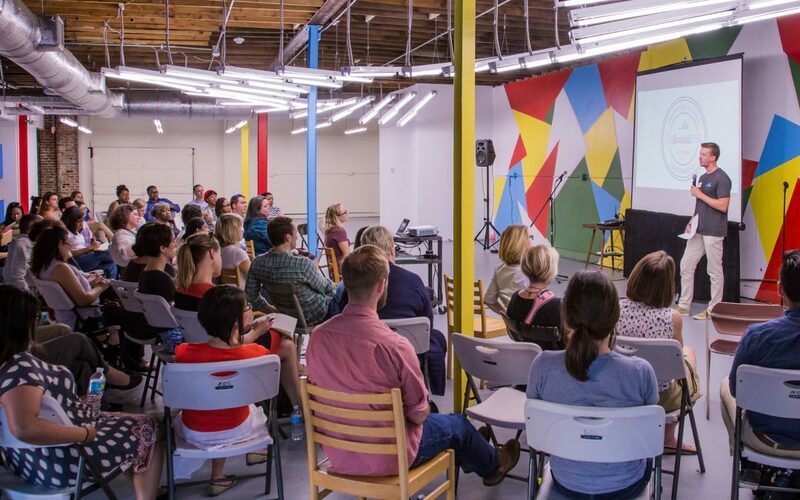 It’s always a special treat when we can find a talk from a past TEDxRVA event that’s on-topic with a Salon because it gives us an opportunity to invite the speaker and their organization to come and give a “where are we now?”-style update. After screening Sarah and Richard’s talk this month, we got to hear Tim Hettermann of UnBound RVA share about what’s been going on over the past two years. He discussed the lessons they’ve learned and adjustments they’ve made to better help local entrepreneurs launch successful businesses. Between the talks and after we officially wrapped, people were busily connecting with each other, sharing ideas, and diving deep into what it means to support social entrepreneurship locally in RVA. We all left challenged and inspired with a new way to see our city.